This wort is coming to a boil. Already you can see a small amount of break material has formed. 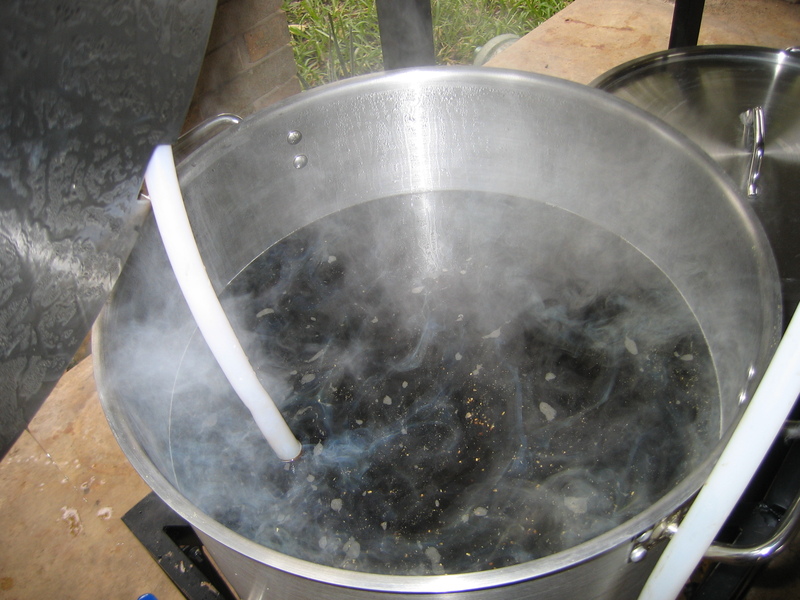 When most homebrewers consider pH in brewing, they think about achieving the proper mash pH. However, hitting the proper boil pH (of 5.1–5.2) is also important. Having wort in the right pH range at the end of the boil has a few benefits, most notably better hot break production. As wort pH decreases, there is also less color pickup in the boil and hop bitterness becomes more pleasing, although hop utilization decreases. Sometimes (perhaps most times), having an ideal mash pH of 5.2–5.6 will ensure that your boil pH drops into the proper range without any intervention by the brewer. However, this is not guaranteed. Two different unboiled worts can start at the same pH, but end up at different post-boil pH levels, even if they are boiled for the same time and at the same intensity. Most often, if the boil pH is out of range, it is too high. Most of the time, you’ll see your hot break improve after the first addition. If two additions of calcium don’t work, adding more calcium is probably not going to solve the problem. Finally, if you do have a pH meter, you can also measure your wort pH in the final 15 minutes of the boil, and adjust it with acid (such as phosphoric acid) to a pH of 5.1–5.2, if needed. Why is a better hot break important? What does that do for the beer? Coagulating the hot break and separating it from the wort after chilling yields a wort with fewer proteins in suspension. The resulting beer will also have a lower protein level and be less susceptible to chill haze, which is formed when proteins and tannins come together in chilled beer. It will also be more biologically stable — i.e. contaminants (beer-spoilers) will have a harder time growing in it without the nitrogen found in proteins. How would you recommend adjusting your boil based on the information here? If we notice we aren’t getting big, fluffy hot break, is there an easy way to tell if our pH is high or low? I’m thinking we would need colorphast strips or a pH meter to make sure we don’t drop the pH when we need to raise it. The thing is, if your boil pH is off (as indicated by tiny specks of hot break in your kettle, not larger flakes), it is most likely going to be high. Unless you added something to the kettle that was acidic (like fruit), you’re much more likely to be over the optimal pH than under. So, if your break doesn’t look as good as it should, add some calcium. In almost every “normal” circumstance, you’ll move the pH in the right direction. If you think your pH might be too low, then you should invest in a pH meter because something out of the ordinary is going on. That’s good info. I should have realized the pH would probably high. I wish I would have checked on this before I brewed yesterday. My pale ale had a lot of small, flaky hot break. I could have tried adding calcium. Oh well, now I have an excuse to brew again! Great info. I love simple rule of thumb techniques that don’t require the purchase or building of yet more brewing equipment. PROST! Why not lactic acid instead of calcium for pH reduction in the boil? You can use lactic acid, too. Calcium helps in the boil in other ways, too, so I use calcium. Is it safe to assume your pH values are taken at room temp? Thanks for the article., very instructive. We use to add 6 grams of gypsum to the boil as routine (6,8 gal batch), because of we have read in Graham Wheleer’s Brew Your Own British Real Ale that it will improve calrity, stability and yeast performance. But we did’t know why…. You said that the calcium addition you choose between addin calcium sulfate or calcium chloride. Will this decission afect the chloride/sulfate ratio, and the final taste of the beer? This adds calcium and either sulfate or chloride, depending on which mineral you add, to your wort. So, the ratio is changed a bit. If you are worried about the ratio, you can add either gypsum (calcium sulfate),, calcium chloride, or a combination of the two to preserve the chloride to sulfate ratio. A post-boil pH that is too low is uncommon. I am not sure what might cause this. (As always, I would make doubly sure your pH meter is calibrated.) One possible negative side effect of low pH would be incomplete hot break formation. How low is the pH ? is removed normally by whirlpooling a few minutes after boiling or via a hop filter. Hot break is not desireable in the fermenter. Cold Break precipitates during rapid cooling of the wort and is beneficial to yeast as it provides nutrients for the yeast. Tests have demonstrated that leaving the cold break in the fermenter does not impact beer clarity or flavor. I have not confused them. The article discusses only hot break. I don’t even mention cold break, or the implications of carrying over break material to the fermenter. [Also note that most homebrewers use immersion chillers, so hot and cold break — along with hop debris — is mixed in the bottom of their kettle after chilling. Brewers who use counterflow or plate chillers can leave their hot break behind in the kettle and deal with (or not) their cold break in the fermenter.] In any case, what I wrote only addresses the effect of pH on hot break formation in the kettle. This was funny – to me anyway. There is an old brewer’s rule of thumb from ale brewing. Add half of the minerals that you added to the mash in boil.